I look at least 10 new apps and tools a day that all promise to be the next big thing. Usually they promise much and deliver little. They are usually an imitation of something else I’ve seen before, perhaps just a little improved. Every so often though I see something that I really think is worth sharing. I’m a big fan of Marc Drees’s blog Recruitment Matters, with a little help from Google translate because it is all written in Dutch. The only recommendations Marc usually makes is why you shouldn’t use one product or another, and more often than not he is proved to be right. I’ve been on the receiving end a few times myself. We all have multiple identities online, but we have no way to map and search them all easily. Falcon solves that. Welcome to the next generation of white pages. I know we have seen similar tools like TalentBin and the SocialCV, but these are subscription services that require a licence and take a bit of getting used to. This is simple and free, and we like free. Falcon is a Chrome extension that you add to your tool bar. You get a small red “F” icon on the tool bar that you can turn on and of as you need it. The Chrome store says that Falcon enables you to discover anyone’s social details on Twitter, Tweetdeck, Github, Dribble and HackerNews. 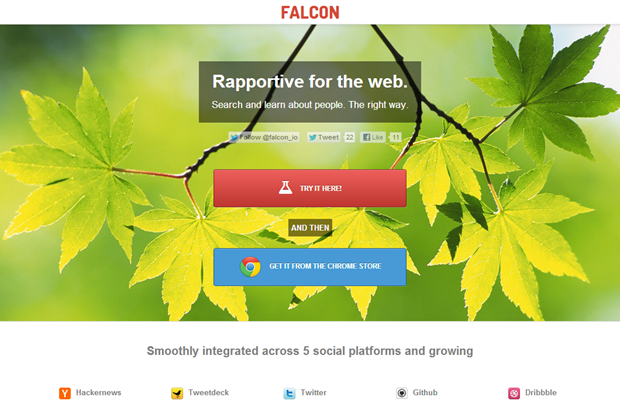 The store describes Falcon as Rapportive for social networks. I’ve tried it out extensively on Tweetdeck, Twitter and Github. It takes seconds to show me the social profiles including a Twitter bio, klout description of what the target talks about, e-mail address, LinkedIn, FourSquare and Facebook addressabout.me profile and a host of other locations. (Some I’d even forgotten I had,) or the most part it is error fee. (See the exceptions below.) The search window pops up on the right hand side of the screen, keeping the original site open. The only downside I can find is that you need to either hover over a name as an instant reference, or enter a social URL in to the search bar, so you need a start point. There is also the occasional glitch when the same nicknames are used by different people on different platforms. That is really nit-picking, because apart from hat its brilliant and lightening quick. Search Tweedeck for geek words and instantly check the results before connecting or adding to a Twitter list for following in a column in Tweetdeck. This is an instant add-on to the Sourcers toolbox. Hat tip to Drees for the spot. Go download it now, and if you want more tools like this, I’m going to be sharing 20 at The Recruitment Agency Expo in London on the 26′th Feb. It’s free but tickets are limited. PS: I will be continuing my review series next week, and I have 3 new case studies coming up. Keep following! Looks like a great tool. I wonder whether it would eventually work on any website / social network? TalentBin has a similar free extension that I use for Chrome, have you tested it? Very interesting app! I wonder if apps like these will eventually make people realize that its never a good idea to post their drunk party pictures on the Internet. I doubt it, but its nice to dream! I got such a good information, That your gave the best and great explanation I like it. You made a good site and sharing the best posts. they very useful and it’s very interesting one. I am impressed by your site and thoughts they amazing.